If Lee Harvey Oswald (or an Oswald impersonator - I don't really care that much) was being used as bait in Mexico City; what, or who was the fish that the fisherman hoped to catch? Was the fishing expedition tied to the use of the Harvey Lee Oswald name? The earliest time I can find the name, Harvey Lee Oswald being used was in Russia in 1960. I have not fleshed this out, but I have read in the past that there was a CIA file under the name Harvey Lee Oswald, and it ties back to the Mexico City incident and Angleton's mole hunt. This Harvey Lee Oswald file may indeed go back as far as Oswald's fake defection to Russia in 1960. As Dulles was the former Director of the CIA, he would more than likely have been aware of it. Included in CE 985 is a Letter from the Department of State to the Commission, dated May 18, 1964, with attached documents. It says that 985 is a translated copy of a note submitted by Dobrynin on May 5, 1964. 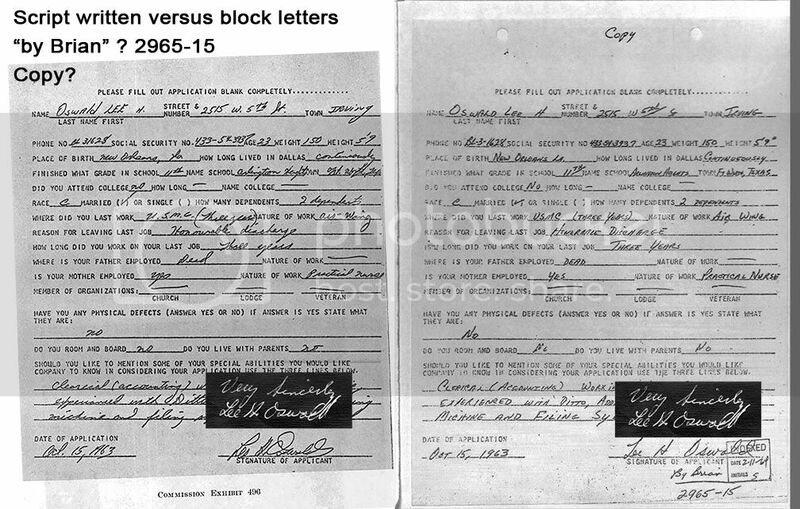 In this letter, it says that Harvey Lee Oswald's request for USSR Citizenship was denied. 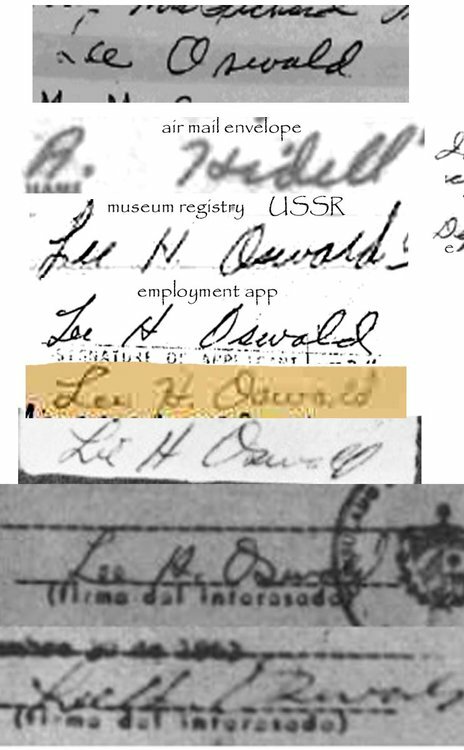 It doesn't say when he applied for that citizenship, but the character reference memo from the Minsk Radio factory in CE 985, p. 433 https://www.maryferrell.org/showDoc.html?docId=1135&relPageId=447&search=%22Harvey_Lee%20Oswald%22 is dated December 11, 1961 and refers to “Citizen” Harvey Lee Oswald. There is an application for an identity card, which was granted on January 4, 1960, 1961, and 1962, but no application for citizenship, and no correspondence from the Soviet Government denying such an application. So whose application for citizenship was denied? 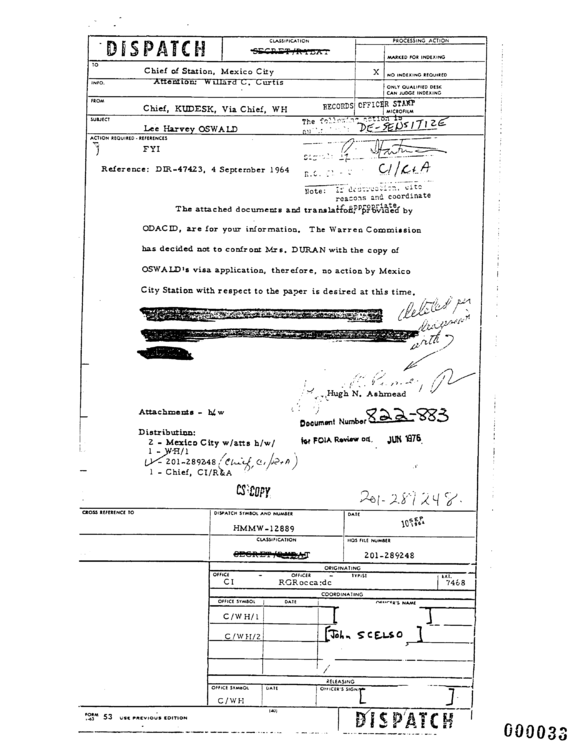 On page 433 of that CE Exhibit (CE 985), it says that “Citizen” Harvey Lee Oswald was hired as a regulator at the Minsk Radio Plant on January 13, 1960. Peter Dale Scott before the ARRB: October 11, 1994. “In fact, the cover sheet mentioning this file is available from the Mary Ferrell Foundation website. It is NARA RIF 124-10029-10270, FBI serial MX 105-3702-254. It is from “Wesley” [SA Howard D. Wesley], has the title “Information re Allegations re Oswald case,” and (apart from still classified cross-file references) contains only this reference: “105-2137, [corrected manually in ink to “3702”] (Harvy Lee Oswald).” (It makes no reference to “Lee Harvey Oswald.”)3. So, who, or what, was the fish the fisherman hoped to catch? Was the fish a conduit, a pipeline, for information being passed? Was the fisherman waiting to see where in Soviet circles Harvey Lee Oswald would turn up post-MC? Did you not say at one time that the whole visa clipped application with Duran looked fishy to you also? I think you gave two reasons. 2001 "SS-100-X" in CAR CRASH CULTURE, Palgrave/McMillan. Actually, I was just joking. I believe that Lee Oswald did go to Mexico City so in no way woud I think that he stayed in New Orleans with Judith Baker (whose story I don't endorse). I do realize that, Francois. That's an interesting concept David. Not to distract from the MC topic. But the FBI, CIA, Byrd (?) senate investigation on weapons transport in the US at the time, and US Post Office, involved in that investigation at the time, would not notice the shipment or non receipt of the rifle or pistol to Oswald, that pinko commie defector. Should have raised red flags for Hoover and Angleton both. Why didn't it? The Evidence IS the Conspiracy. CORNWELL - So, from all the circumstances, did it appear to your that he just went somewhere locally and had the pictures made? TIRADO - Yeah. I think that I already explained (to) him where he could take the photographs. CORNWELL - You told him some locations in town where ge could go? Were there some right in the neighborhood of the Consulate there? TIRADO - That I don't remember. CORNWELL - Just one. The ... I believe I asked you this, but just to be sure, although the application was typed with a carbon to make two copies with one typing, did he have to sign both independently? Or did you allow them to use a carbon to sign the paper? TIRADO - No, no. It was the original. CORNWELL - Two original signatures. All right. I wish you would annotate better the images that you post. 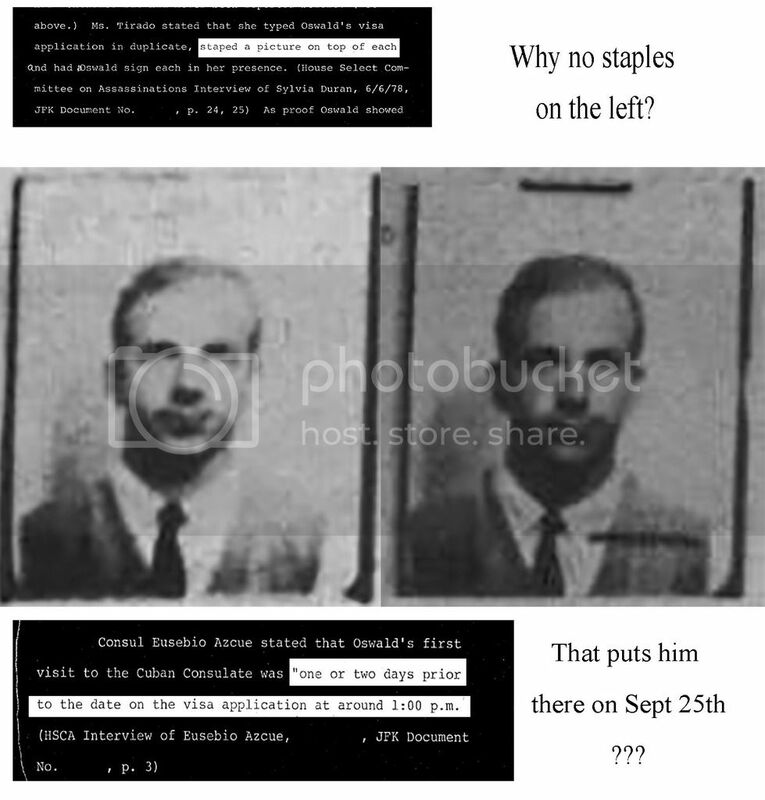 Is there a point to be made regarding the top image showing the photo of Oswald in three places? 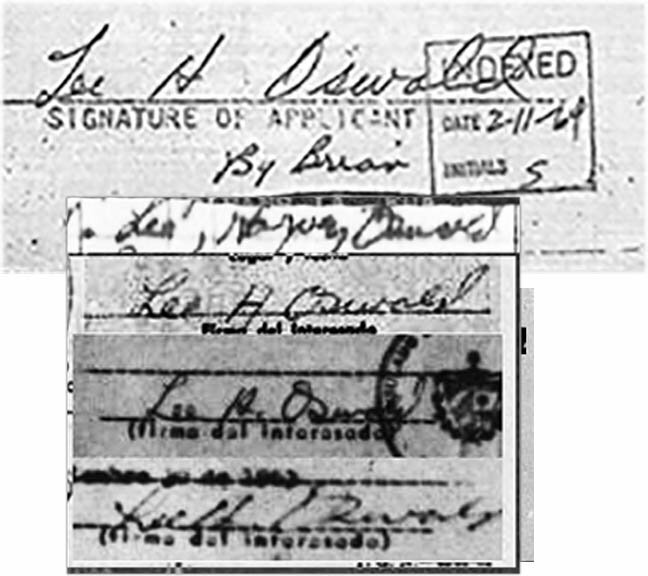 Regarding the image with the two signatures, I take it that those are supposed to be Oswald's signature, one on the visa application and the other on the carbon copy of the application. I assume your point is that the two signatures are way different from each other. I've looked at numerous examples of Oswald's signatures and they vary from one to the other considerably. Have you checked to see if each of these two signatures look similar to any of his other signatures? Regardless of that, it is certainly odd that the two signatures are so different from each other. It seems likely to me that the signatures were really made on two different occasions. And/or by two different people. BTW, my hat's off to you for the fine work you've done on this very important subject. I believe it will prove to be instrumental in solving the case. All the more reason to know your make-believe Oswald Patsy Framers must have all been total morons! Because only a complete idiot would want to have a blond guy who was 5-feet-5 try to impersonate a guy who had dark hair and was 5-9. Just how stupid were your Mexico City plotters in 1963, Jim? On the second one, that does not look like an original signature to me, and it does not look like the same guy signed them. One last thing David, did you not say once that there was also something about the way the application was stored and stapled that was also odd? To me this about does it. Does anyone really think those two signatures were signed at the same time? And can anyone think it was on the 25th? With the new evidence from Father McChann in the Jackson book, which K and K will be reviewing soon, this all but guarantees there was an imposter. Because he swears that the visit to Odio's was on the 27th due to a definite time landmark. David, where are the staples? I don't even see any staple holes. David, where are the staples? I don't even see any staple ho﻿les. Speaking of staples... So, you think the visa application in the WCR is the same as the one sent to Cuba (or the one we supposedly got from them)? Where did the WCR get the exact image without the staples? Simple the exhibit, the application and a blowup of the stapled image.... and yes, they match another set of signatures... guess where? the bottom signature looks an awful lot like the signatures from the trip to Russia in 1959. So you are saying that this photo that either the CIA or State Dept produced for the WC as the visa application, that photo was of Oswald on his return from the USSR? I hope you are aware of how this further blows up things. The official story says that he went out to get a picture from one of this many photo shops. If he brought this picture with him then he would never have done that. It is simply amazing to me how it took over fifty years to excavate this pile of utter rubbish that the WC fell for in MC.